Washington, USA -- When most people think of the Dalai Lama, they think of his saffron and maroon robes, his shiny shaven head, the mala beads around his wrist, his puckish smile and cosmic insight. He is, after all, incarnation of the god of compassion. Yet part of the drama and power of his life is that while his head may be in the clouds, for more than half a century his feet have been firmly planted in the unforgiving realm of realpolitik. Over the years, as I've reported from El Salvador to Lebanon, from Ethiopia to Sri Lanka, I've come to see the Dalai Lama as one of the most realistic, far-sighted politicians in the world. Soon after violence erupted in Tibetan areas in China last March, restless young Tibetan exiles began clamoring for dramatic protests against the Chinese government. The countdown to the Beijing Olympics in August was their chance, they said, to force China to end almost 60 years of oppression in Tibet. People around the world joined in their call for action. 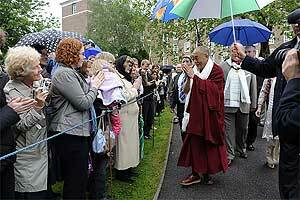 But the Dalai Lama continued to urge patience, dialogue and tolerance. An agreement reached by people who are jealous, territorial or angry, he often says, will last only until the next fit of temper. The Dalai Lama also opposes a boycott of the Olympics and recently reminded Tibetans to forswear violence. Recently he even announced that if, by chance, he were invited to the Olympics, he'd be "happy" to attend. And two weeks ago, he led a Buddhist prayer service for the victims of China's massive earthquake. I've been following the Dalai Lama and his ever more unsettled people in their exile home in Dharmsala, India, for 33 years now, from the foggy summer day when I met him as a teenager to the day after his Nobel Peace Prize was announced in 1989 to our most recent visit in Japan last year. Nearly all his positions come as unexpected to those of us conditioned to politics-as-usual. When his people understandably cry out in frustration and even rage toward Beijing, the Dalai Lama reminds them that no one can be forced to be reasonable. China, he knows, has a prickly and fearful tradition of responding to the slightest resistance with violence. Gestures of defiance may attract headlines or play well in Hollywood for a few days, but in the long run, opposing a nation 215 times more populous than your own is tantamount to suicide. At heart, his position is both pragmatic and moral: China and Tibet are neighbors, and their destinies are intertwined. He has taught his followers that throwing stones at a neighbor's window -- or even leading protesters to his front door -- can harm the entire neighborhood for years to come. Such clear-eyed realism, and such practical applications of monastic principles, are not always what the world wants from the Dalai Lama. When the head of Tibetan Buddhism offers philosophical teachings outside his home in Dharmsala, thousands of foreigners join the monks and ordinary Tibetans day after day in freezing weather amid a crush of bodies. But as soon as he turns his attention to Tibet's political situation, as he does every year on March 10 -- the anniversary of the 1959 uprising during which he fled China -- his audience thins out as his followers from New York, Dusseldorf and Sydney disappear. We don't need another leader in the real world; we want someone who can show us a better one. It's easy to forget that the Dalai Lama, brought to spiritual power as a 4-year-old boy, has been leading his people longer than any other figure on the world stage -- 68 years and counting. He was dealing with Mao Zedong and Zhou Enlai 58 years ago, and in 1954, against his people's wishes, he left for a yearlong tour through China that included a visit to Beijing. For decades, he has been confronting radicals in China and within his movement. In the early 1970s, when CIA-trained Tibetan fighters continued a guerrilla war against Beijing, he sent them a taped message asking them to lay down their arms. The insurgents obeyed, but a few were so heartbroken that they took their own lives. moment for a dramatic response. But the Dalai Lama, who has long stressed that what matters is what happens after the Olympics, keeps emphasizing the importance of speaking with the Chinese rather than lashing out. China recently resumed talks with representatives of exiled Tibetans, but the leaders in Beijing remain curiously reluctant to meet with a monk described by President Bill Clinton as "an honest man" and by President Bush as "a man of peace." With characteristic directness, the Dalai Lama confessed to me more than a decade ago that his policy of maximum concessions -- calling for "autonomy," not full independence from China -- had achieved little, as China continued cracking down on Tibet. But that did not make it a mistaken policy, if only because he was looking to the future. As a pragmatist, he knows that mere gestures of resistance are not going to sway the hard-nosed leaders in Beijing. And as one who feels his people's sorrows as his own, he realizes that violent attacks against, say, Chinese power plants or Chinese- owned businesses will only bring more suffering to Tibetans in Tibet (and to the Chinese as well). For all the years I've known him, and especially in the last 15 or so, the Dalai Lama has spoken of the importance of working with the Chinese, who will realize in time, he believes, how much they have in common with the Tibetans. I have sometimes thought this a quixotic position or the last hope of a desperate man. But the last time I visited the Tibetan capital of Lhasa, some of the Chinese I saw there were making offerings at the Jokhang Temple in the heart of the old city, seeking out lamas and reading Tibetan texts. And across China, at least until the protests swept through Tibetan areas in March, Tibetan Buddhism had become decidedly hip. If Americans and Europeans and Japanese look to this tradition for a spiritual fulfillment that their own cultures haven't provided, how much more so will many Chinese, who with their newfound prosperity are searching for spiritual richness, too? During my week with the Dalai Lama in Japan last November, we walked into a conference room in Yokohama, and the 60 or so people awaiting his arrival began to sob. Chairs had been set out for them, but they all threw themselves onto the ground, clustering around the holy man, trying to get his blessing. Every one of the people so anxious to touch him was a Han Chinese, from the People's Republic. Perhaps the biggest surprise of recent weeks was the petition released by more than two dozen Chinese intellectuals and writers calling on their government to speak to the Dalai Lama, end "suppression" in Tibet and allow an independent body to investigate the recent disturbances. We might have expected Tibetans to risk their lives by making such an appeal. But Chinese? No one believes that Beijing will change overnight, but as the Dalai Lama often notes, we should be ready when it happens. It's striking that two of his longtime and most loyal champions are Vaclav Havel and Desmond Tutu. One day Havel woke up in prison; weeks later, he was unanimously elected president of Czechoslovakia. One day Tutu woke up to a life of apartheid (though a Nobel laureate, he had not been allowed to vote in all his 62 years); the next, he was free of official racism. If the Dalai Lama does receive an invitation to the Olympic opening ceremonies, the Chinese can count on at least one monk who will extend a hand of friendship at their coming-out party -- to remind Tibetans, Chinese and the world that they have everything to lose by seeing each other as foes. Pico Iyer is the author of "The Open Road: The Global Journey of the Fourteenth Dalai Lama."